As we walked off the ferry and down the ABC jetty, Mawar Beach Chalet is just south from us. So that's one good point right from the word get-go: Mawar Beach Chalet is easy to find and close to the jetty, a very short walk. The next most obvious benefit of staying at Mawar Beach Chalet is its low price. 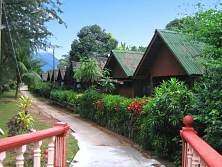 Mawar Beach Chalet is a considered a budget lodging and I'm not kidding when I say this. I don't know if rates have gone up since, but when we were staying at Mawar Beach Chalet, their fan-only 2-bedder rooms were going for a paltry RM 35 per night, a steal. No hot-water showers of course, but still, RM 35 is very very cheap, given that you're on one of the most beautiful islands in the world. We were with three people and we'd decided that air-con is indispensable on a tropical island, so we opted for the slightly more luxurious 3-bedder room with air-con. It set us back an acceptable RM 120 per night. I said slightly just now, because our room didn't include hot-water shower. What we did get was a clean, albeit basic room right at the beach, yet away from the noisier parts of ABC's beach. This was great because we got to enjoy the peace and quiet of this pretty part of Tioman, whilst still having full access to the happening stretch of ABC beach, just up from our room. By the way, our room also had a view of the sea that was just breathtaking. Mawar Beach Chalet actually has a restaurant too and, as we discovered, it's not a bad one at all. All three of us really enjoyed the meals here and the eatery's fun beach ambiance just added to the all-round awesomeness of Mawar Beach Chalet. Special mention here for the seafood BBQ, by the way. It was, in a word: fantabulous! Incidentally, you'll find that living just off the sea makes for a lot of wet clothing, so when you're running out of stuff to wear, just pop into one of the laundry places here with your kit. They'll do the whole washing, cleaning, folding for less than RM 10 per kg. Nice. It goes without saying that Mawar Beach Chalet is a great place to stay if you're in Tioman to scuba dive. ABC is peppered with scuba companies, so you never need to walk far. The scuba locations are a short boat-ride away and I was impressed by the healthy state of Tioman's marine flora and fauna, as well as the quality of its coral gardens. The verdict on Tioman and Mawar Beach Chalet? Let's put it this way: We'll be back. 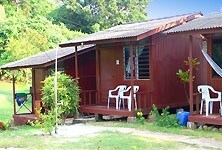 Tip: As with almost all budget lodgings in Tioman, Mawar Beach Chalet has just a modest number of rooms on offer. So the smart choice would be to book pretty early, especially since Mawar Beach Chalet is in demand with locals; invariably it's fully booked on weekends, public holidays and school holidays. If you spot Mawar Beach Chalet on Agoda great. If not, then check their Facebook. By the way, Mawar Beach Chalet has been awarded "one of our recommended hotels in Pulau Tioman" by Lonely Planet. Lonely Planet aren't one to dish out kudos like this one willy-nilly, so well done to Mawar Beach Chalet.